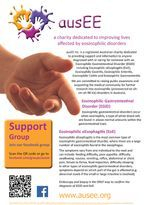 Click the image above to view our 'easy to understand' Eosinophilic Disorders Explained online medical brochure. You can pass this link along to your friends, family, child care, schools, etc. to help explain EGIDs to them. What are Eosinophilic Gastrointestinal Disorders (EGID)? Eosinophilic gastrointestinal disorders (EGID) occur when eosinophils (pronounced ee-oh-sin-oh-fills), a type of white blood cell, are found in above-normal amounts within the gastrointestinal tract. Eosinophils are important in your body’s defence against parasitic infections (e.g. worms). However, they are also involved in allergy. In some individuals, eosinophils accumulate in the gut in response to food and/or airborne allergens and can cause inflammation and tissue damage. What is Eosinophilic oEsophagitis (EoE)? Eosinophilic oEsophagitis (EoE) is the most common type of Eosinophilic Gastrointestinal Disorder (EGID). The cause of EoE in some individuals appears to be due to an allergy to food(s) and/or aero-allergens. The current estimated prevalence of EoE is 1–4 cases per 10,000 individuals and rising. People with EoE commonly have other allergic diseases such as asthma or eczema. EoE affects people of all ages, gender and ethnic backgrounds. In certain families, there may be an inherited (genetic) tendency. Males are more commonly affected than females. What are the symptoms of EGID & EoE? 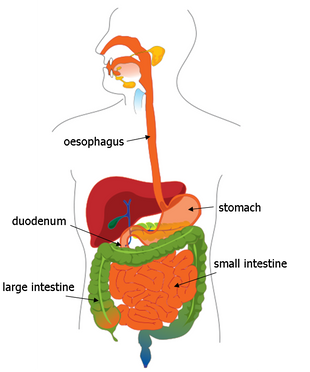 In other types of eosinophilic gastrointestinal disorders, symptoms depend on which part of the gut is affected (e.g. diarrhoea and bloody stools if the small or large intestine is involved). In addition to (not in lieu of) the above, some people also experience pain in their lower limbs (legs, ankles & feet), ear infections, asthma, croup, migraines, mysterious fevers, and more frequent “colds” when they are reacting to a food. Behavioural changes have also been reported in some children. How is EGID & EoE Diagnosed? 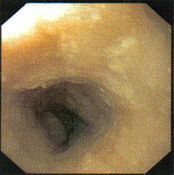 Endoscopy and biopsy is the ONLY way to confirm the diagnosis of EGID and EoE. It cannot be diagnosed based upon symptoms alone. Endoscopy – a gastroenterologist performs an endoscopy by using an endoscope (a tube with a light and camera at the end) to look at the GI tract and take small biopsies, usually from the upper oesophagus, lower oesophagus, stomach and duodenum. The oesophagus may look visually normal, but when the tissue is examined under a microscope, an abnormal accumulation of eosinophils can be detected resulting in diagnosis. 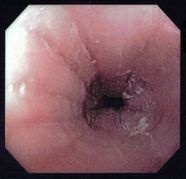 It is also possible that the endoscopist could visually detect rings or furrowing, thickened folds and white plaques. Biopsy – the biopsies taken are later reviewed by a pathologist. A high number of eosinophils (counted per high power field under the microscope) suggest the diagnosis of EGID. Eosinophils can normally be found in small numbers in all areas of the GI tract except the oesophagus. GERD/GORD (acid reflux disease) is associated with low numbers of eosinophils in the oesophagus. With eosinophilic oesophagitis, the number of eosinophils seen is much higher and remains elevated despite treatment with acid reflux medication. A minimum of 15 eosinophils per high-power field are required to make the diagnosis of EoE. Proton-pump inhibitor-responsive oesophageal eosinophilia (PPI-REE or PPI-ROE) is a newly recognized entity that must be differentiated from EoE. PPI-REE refers to patients with esophageal eosinophilia on biopsy who respond to a course of PPI therapy. What is the Treatment for EGID & EoE? There is no cure for EGID and EoE, but the goal of treatment is to eliminate the eosinophils in the affected area, thereby alleviating symptoms. An Elimination diet is one common treatment option. It is important to speak with a qualified Allergist/Gastroenterologist, and have a Dietitian experienced in food allergy before undertaking an elimination diet. The elimination diet is tailored to the individual. Some individuals may be able to identify specific food(s) that trigger symptoms, but others cannot. More than one food may be involved. Some doctors may suggest the patient remove the top 6/8 food allergens (milk, egg, soy, wheat, peanut/tree nut, shellfish/fish). Recent studies indicate milk, egg, wheat and soy as the most contributory to EoE with cows milk the most common food involved. Another option may be removing food(s) the patient has tested positive to via skin prick testing, specific food IgE testing and/or atopy patch testing. In EGID it is not uncommon for allergy skin prick testing to be negative. This means that a food is at low risk for immediate (minutes to hours) reactions. Food proteins can however stimulate inflammation over days to weeks and this may require other tests including exclusion periods. With any elimination diet it is important to ensure diet is balanced, growth is maintained and that there is a plan in place to re-assess. Elimination diets may be less effective in adults than children and aero-allergens are thought to be involved more in EoE with adults than children. An Elemental diet consists of only a special medical food called an elemental formula, which contains amino acids (the building blocks of proteins), fats, sugars, vitamins and minerals. They provide all the nutrition a person needs if enough is taken. Some individuals need a feeding tube to ensure they are getting enough of the formula or to give the oesophagus a rest. The patient is placed on the formula alone for a number of weeks, and will then have a repeat endoscopy to see if there has been improvement. If the condition has improved, then foods are slowly introduced back into the diet and a repeat endoscopy is often performed to ensure ongoing control with food reintroduction. Medication can be used alone and/or along with dietary management. The most common medications used are corticosteroids. These are either sprays that are swallowed, or a liquid preparation typically mixed with an artificial sweetener to make a slurry that is swallowed. These medications coat the oesophagus and assist in getting rid of eosinophils. Acid reflux medications may also be used. The doctor will determine which, if any, medications are appropriate for each individual. Oesophageal dilation is an endoscopic procedure that may be required for patients with long-standing symptoms before diagnosis and/or who present with oesophageal strictures. Dilation can lead to symptom improvement, but some people may require multiple dilations. References: www.allergy.org.au, www.cincinnatichildrens.org, www.apfed.org, The American journal of gastroenterology. 2013;108:1854–1860. doi: 10.1038/ajg.2013.363. ausEE Inc. ABN 30 563 569 016 Australia ©2009-2019 The information on this website and any related links is for general information and support purposes only and is not intended as a substitute for professional medical advice from your doctor or other health care professional.